​Doris Ellen spends her spare time as part of the ensemble for the AfterWork Theater Project, a non-profit organization composed of individuals of varied professional backgrounds who love to sing, dance and act for a good cause. On occasion, she works as a music director/associate music director/teaching artist and a vocal captain for projects that are in-line with the said theater company’s non-profit corporate initiatives. June 2018: Sing Out: Disney! September 2017: NY Parks and Rec's GE Sings-Out! March 2017: Sing-Out: 90s Flashback! March 2017: Sing-Out: Broadway Revue! November 2016: West Side Story! March 2016: Sing-Out! Gender Benders! ​Doris Ellen was also involved as the chorus captain/ensemble for "Spoliarium, The Opera." 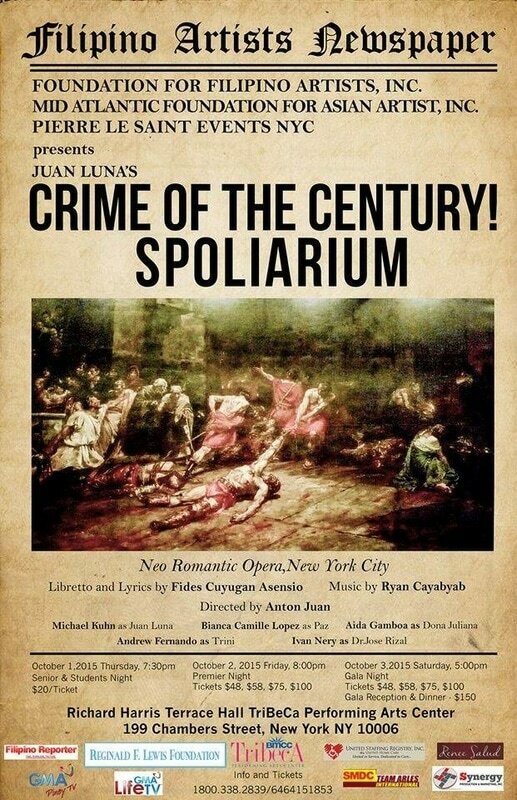 A production of FilArts New York staged at the Tribeca Performing Arts Center on October 1-3, 2015, "Spoliarium," in its three-acts is based on an internationally-acclaimed painting that depicted a deeper meaning of social cancer for the Filipinos under the 400 years of the Spanish colonization. Libretto by Fides Ascensio, and Music by Ryan Cayabyab.